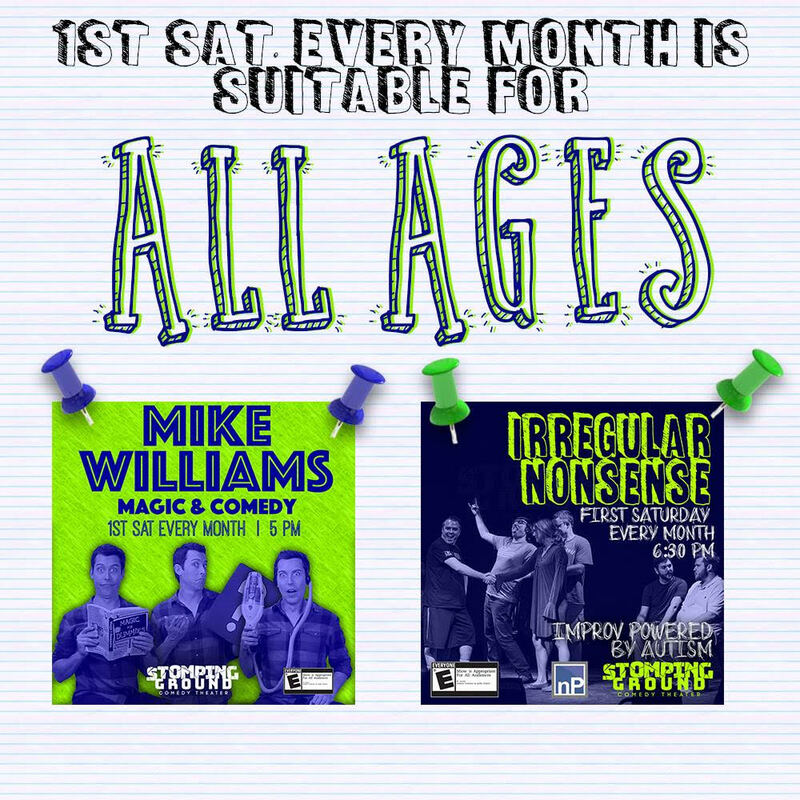 The First Saturday of every month, Stomping Ground presents a special two-show block of family-friendly and sensory friendly comedy rated E for Everyone. At 5 pm, Mike Williams presents an hour of magic and comedy for audiences of all ages. Two time “Magician of the Year” and Dallas Observer’s 2018 Best Magician Mike Williams has performed magic for over 20 years and has thrilled audiences all over the world- Hollywood to New York, India to Australia, and television and commercials. He blends state-of-the-art magic, quirky comedy, and audience interaction for a one-of-a-kind live performance. At 6:30 pm Stomping Ground presents Irregular Nonsense, a one-of-a-kind group created with NonPareil Institute. The clever, out of the box stylings of Trenton Lundgren, Trevor Poynor, Jake Raybon, Kevin Sharp, Isaac Pinkus, Rivka Notelovitz, and Bryan Kersey will leave you laughing and inspired. This show is interactive for those who wish to participate and sensory friendly. Both shows are rated E for Everyone but parental discretion is advised. Seating beings 15 minutes prior to the start of the show. Tickets can be purchased for each show separately, or you can purchase a ticket package that includes both shows for $15. To purchase individual tickets please visit the individual calendar event.